A service is bound when an application component binds to it by calling bindService(). A bound service offers a client-server interface that allows components to interact with the service, send requests, get results, and even do so across processes with interprocess communication (IPC). A service is started when an application component, such as an activity, starts it by calling startService(). Once started, a service can run in the background indefinitely, even if the component that started it is destroyed. That is where IntentService are used. handle all start asynchronous requests (expressed as Intents) on demand, one at a time. Clients send requests through startService(Intent) calls; the service is started as needed, handles each Intent in turn using a worker thread, and stops itself when it runs out of work. Unbound service is started when component (like activity) calls startService() method Where As A service is bound when another component (e.g. client) calls bindService() method. 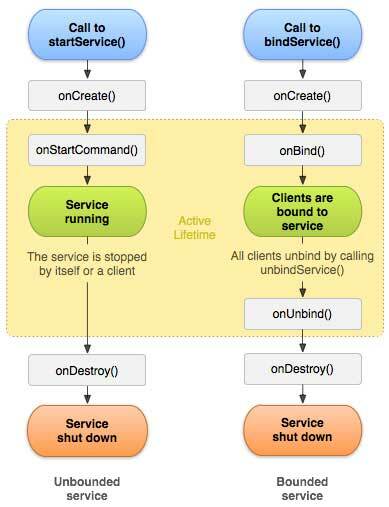 The Unbound service can stop itself by calling the stopSelf() method. Where As The Bound service cannot be stopped until all clients unbind the service. The Unbound service runs in the background indefinitely. Where As The Bound service does not run in the background indefinitely. The Unbound service is stopped by stopService() method. Where As In The Bound service, The client can unbind the service by calling the unbindService() method. Unbound Service is started by calling startService() method. Bound Service is started by calling bindService() method. Service itself calls SelfStop() method. BoundService then return IBinder object. When you want two-way communication with your Service then you should bind your service with Activity. Eg. Playing music in the background with pause, play option (Activtiy <-> Service). Go with unbound or started service when you just want your Service to update your Activity (Service->Activity). Eg: Timer Service which updates Activity every second. You have written some Service which deals with Location changes. If you want to update your activity when you move 10 meters (Go with unbound service). If you want to see the coordinates of your current location when you click some button in the activity. (Go with the bound service). Not the answer you're looking for? Browse other questions tagged android android-service or ask your own question. Android : difference between invisible and gone? What is the difference between compileSdkVersion and targetSdkVersion?